Returning home, I went about my day, forgetting about that experience. Some time later, however, I found an article from NPR talking about eating acorns. 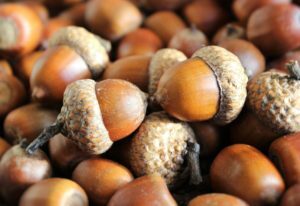 A typical process for using the nuts is to remove them from a shell, grind them up, soak them in water to allow the tannins to leech out, and then dry it out to use as flour. My first acorn flour after drying it in the oven. After reading that, I recruited helpers (my kids) to go back to the park armed with a bag. We collected a couple hundred acorns which was a blast! My helpers were totally engaged in the the process. We then headed home and spent the next hour cracking them open with hammers and picking out the meat. I gave one nut a quick taste test and while it was incredibly bitter, I could tell there was an underlying sweetness. Next, I set out to leach the tannins. I chose to do the hot water method, boiling the nuts and swapping out the water every ten to fifteen minutes. After a long three hours, the bitterness finally went away. 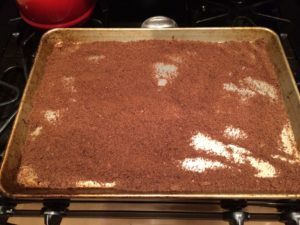 I then dried the nuts in a warm oven, ground them in the Vitamix, and then dried the flour more thoroughly in the oven. After all of this work I had about two cups of flour. 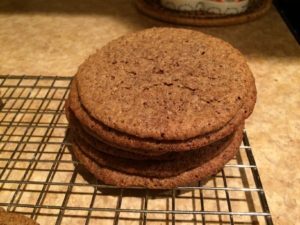 I found a recipe in Outdoor Life for Acorn Peanut Butter Cookies which ultimately tasted like peanut butter cookies with a strong acorny flavor. Hey, the kids liked them so I’ll take that as a win. It was really cool to experience gathering and eating something that grows in nature with my kids. I have incredible respect for folks who used acorns as a staple in their diet. That’s a lot of work! In the future, I’m going to try the cold water method to leech the tannins and am interested in seeing if the flavor is any different. Realizing that cookies probably weren’t a staple in the diet of Native Americans, I want to try making a bread or soup out of the flour next time. Have you harvested and eaten acorns? If so, please share your favorite recipes in a comment or on Facebook and Twitter.